"The Aam Aadmi Party (AAP) people are a bunch of atheists and irreligious lot who don't understand or respect the religious sentiments of people of Punjab and instead indulge in acts of sacrilege. These people have only one agenda of capturing power in the state and then keep the pot of confrontation with Union government boiling. These people cannot be expected to fight for Punjabi pride. 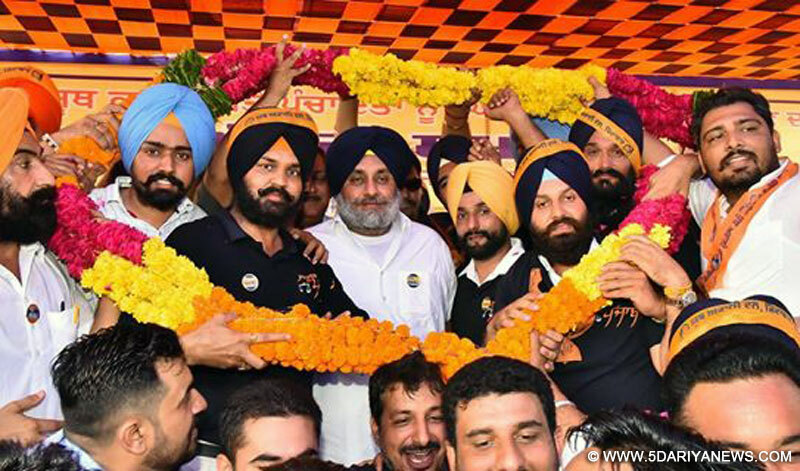 "Strongly castigating AAP for its nefarious designs on the occasion of distributing sports kits and gyms here today at multipurpose stadium, the Deputy Chief Minister, Punjab, S. Sukhbir Singh Badal also took on the Congress and said that during his 5 year tenure as Chief Minister, Captain Amarinder Singh didn't care to venture out into the rural heartland of the state to know the problems of peasantry which forms the backbone of economy of the state.Listing the achievements of SAD-BJP government during the previous 9 years, the Deputy Chief Minister said that the government has given the benefits of atta -dal scheme to nearly 50 lakh families besides other people centric welfare measures like sewing machines for women, free medicine centers to be opened next month, Interest free loans to farmers from co-operative banks, free health insurance for farmers and traders, free power to farmers, free power worth 200 units to every SC households, surplus power, top notch road infrastructure and excellent conditions for giving boost to investments in industrial sector. Earlier, the Deputy Chief Minister distributed 200 gyms and 600 sports kits to youth clubs of Jalalabad region and said that the state government is fully committed to prop up sports infrastructure which is clear from the spending of more than Rs. 500 crore on creating world level sports facilities including Punjab Institute of Sports (PIS) at Mohali besides a network of astroturfs during past 9 years. He also divulged that the final match of the World Kabaddi Cup apart from closing ceremony would be held in Jalalabad.Coming to more Jalalabad centric announcements, he said that 70 more water works would be constructed besides concretized water courses, Complete suhelewa la minor, a hospital having all the modern amenities next month and 6 skill centers out of total 250 to come up in entire state.Among others present on the occasion included Special Principal Secretary to the Deputy Chief Minister -Manvesh Singh Sidhu, OSD to the Deputy Chief Minister -Satinderjit Singh Manta, Deputy Commissioner Isha Kalia, Secretary Sports Vivek Pratap Singh, Director Sports Rahul Gupta, Chairman District Planning Board Prem Valecha, District President SAD Gurpal Singh Gora, Vice-Chairman Punjab Agro Ashok Aneja, District Sports Officer Balwant Singh, SGPC member Subba Singh Dabwala and others.